Summary: A new survey by Safe Systems on community institutions and their IT staffing practices sheds some light on what your peers are doing, and what you can do to stay cyber safe. In most parts of the country it feels warm outside and summer is just around the corner. 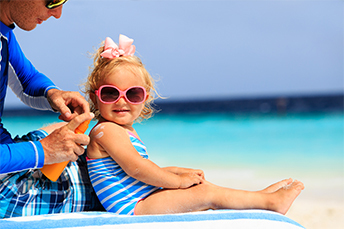 As such, we point out a couple of not so sunny facts about skin cancer from the American Cancer Society to help keep you and your loved ones safe this summer: skin cancer is the most commonly diagnosed cancer in the US and tanning is actually the body's response to injury from the sun. As for sunscreen, research shows a sun protection factor (SPF) of 15 blocks out 93% of the sun's UVB rays vs. 98% when the SPF is 50 (no difference when SPF is above that level). As you slather on the sunscreen to protect yourself against the fluorescent lights in your office and the sun outside of it, we slather you with some data on community bank technology team staffing (bet you didn't see that transition coming!). According to a new survey by Safe Systems on community bank and credit union IT topics, 31% said they have just 1 employee in their IT department, while another 26% said they have 2. Only about 10% said they had more than 5 employees. Digging deeper, we find that while it's nice to be thrifty when it comes to staffing, a lack of manpower in IT can be problematic, of course. At the same time as IT staffing is reportedly scant, IT issues are among the most difficult to deal with. A whopping 81% say information security remains a top challenge. They cite a host of other pressing IT issues, including converting manual processes to automation, meeting customer demands for 24/7 financial access, and keeping up with regulatory requirements. To deal with these challenges, community institutions are spending more. Here, a whopping 81% said they had increased IT spending over the previous 18 months. Since these community institutions maintain such lean in-house IT departments, it begs the question of where additional technology dollars are going. The answer is to outside technology service providers. That isn't necessarily bad, as they may have more specialized expertise to tap, but now you know. The level of outsourcing reflected in the survey is interesting. About 75% say they outsource management of their IT networks to tech service providers. Even for those who opt to maintain control in-house, outsourcing of security monitoring has become the standard, with 86% saying they outsource it. Whether you are outsourcing or keeping your resources in house, the important thing is that you are focusing your IT budget in the right areas. To do this we suggest making sure you stay up to speed on new products and trends. Other areas of focus include: 50% of respondents will replace workstations as needed, 48% will be beefing up IT security and only 23% will increase spending on their cybersecurity assessment tool application (may be because last year got a big boost in this area, as almost 50% of all bankers surveyed increased their budgets here in 2017). In this increasingly complex world of cybersecurity, community institutions will need to continue working hard to keep up. Having the right people and allocating your budget to the right areas will help. To assist on the education front at least, we will continue to pass on relevant information and tips along the way. In the meantime, whether you are protecting yourself from the sun or protecting your bank in some way, stay safe as you enjoy the nice weather for a change. 1) Cadence Bank ($11.0B, TX) will acquire State Bank ($4.9B, GA) for $1.4B in stock (100%) or about 2.5x tangible book. 2) Stifel Bank & Trust ($15.3B, MO) will acquire The Business Bank of Saint Louis ($620mm, MO) for an undisclosed sum. 3) Gulf Coast Bank and Trust Co ($1.6B, LA) will acquire Phoenix Capital Group for an undisclosed sum. Phoenix provides freight factoring, equipment financing and fuel cards. 4) Credit Union ONE ($1.2B, MI) will acquire Hantz Bank ($223mm, MI) for an undisclosed sum. 5) Five Star Bank ($4.2B, NY) will acquire HNP Capital LLC for an undisclosed sum. HNP is an investment advisory and wealth management firm with $334mm of assets under management. 6) Legacy National Bank ($475mm, AR) will acquire Bank of Gravett ($118mm, AR) for an undisclosed sum. The Wall Street Journal reports Goldman Sachs is joining forces with Apple to offer a new credit card in early 2019. Apple hopes to grow its revenue through transaction fees and a fee from Goldman for each new credit card user. For Goldman, the association with Apple will bring in new consumers that are good prospects for additional banking products. The House is reportedly preparing to introduce legislation in the coming months that would loosen reporting requirements under the Bank Secrecy Act (BSA). Among the changes: it would raise the threshold for currency transaction reporting (CTR) to $30,000, direct FinCEN to establish a process to clarify when no enforcement action will be taken and increase the threshold for suspicious activity reports (SARs) to $10,000.